Don’t take chances with your roof. A poorly installed or leaky roof can cause serious structural damage to your home as well as destroy your personal property inside. A properly installed, quality roofing system can last between 20 and 50 years. That’s why when it’s time to replace your roof, call the professionals at ASC. We’ll do the job right. We take pride in our workmanship and stand behind it. Most people only ever have to have their homes roof re-shingled once or twice in their life time. That’s why at ASC, we’ll take the time to answer all your questions and review your options with you. We offer you a wide variety of shingle colors, styles, and sizes from the nations three leading manufactures, GAF, Owens-Corning, and Certainteed. Our experts can help you find the shingles that will give your home a new look and fit your budget. All our shingles come with a guarantee so you’ll know your new roof will last. Our professional roofing team will install the necessary moisture barriers, flashing and gaskets around all your roofs corners and vents to assure your new roof is leak proof. And if your old shingles need to be removed first, we can handle that, too. We guarantee you’ll be impressed by our attention to detail and quality workmanship. Give us a call today. Your roof, gutters, and spouting systems all work together moving water from rain, sleet and snow off your roof and away from your home. This not only protects your home from leaks but helps keeps you basement dry. 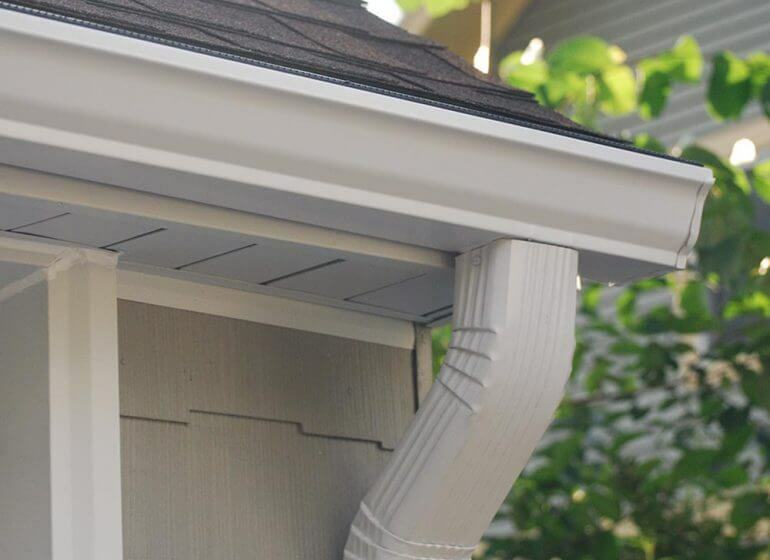 Our seamless gutter and downspout systems are as attractive as they are effective. We offer a variety of colors to match your home beautifully. The seamless design eliminates the problems caused by leaky joints in older gutters. Our professionals will custom make gutters to fit your home perfectly. Our quality workmanship guarantees that they will be installed properly so that water flows out of the gutter and away from your home. Contact us today to find out more.